SMEE & COBAY LONDON. 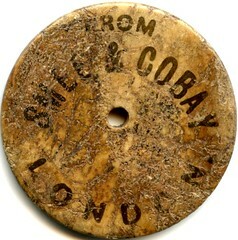 Bone furniture label, 29.3mm. 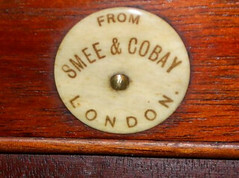 Smee & Cobay were fine quality cabinet makers on New Bond Street, London. Another label in situ on a piece of furniture. While apparently they manufactured at 29, 31, 33, 35, 37& 39 Moorgate, London, E.C. Arthur Smee and William Cobay's partnership was dissolved in 1905 according to a notice in the THE LONDON GAZETTE, JULY 25, 1905.